It's interesting how this question can change over time. For example, when I first started building almost fifteen years ago the extensive use of jigs and templates was something found primarily in a factory setting. I would say Jim Olson is the first builder I became aware of who really effectively applied this to a small shop setting. So when I started offering my own line of guitars it was partly because I was fascinated with the idea of making advancements on the designs I had seen as well as building better sounding guitars. Jigs, efficiency, and accuracy were my ethos. However, today things are very different. 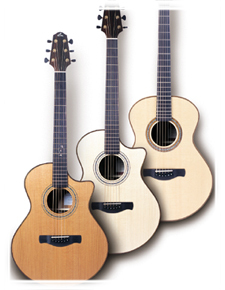 Computer Aided Design (CAD) and Computer Aided Machining (CAM) have dramatically changed the landscape of manufacturing across the board, and that includes guitar building. At first the computer technology was employed by only the largest factories, but as the technology becomes more and more affordable small shops are starting to embrace it as well. These days it is also possible to subcontract a myriad of processes and parts ranging from making complete necks & bridges to the actual finish work. It's a different environment. What is the current wait list? As of Summer 2006 I have a current wait list of about 16-18 months on all orders. How Important is Proper Humidity? Maintaining the proper climate for a new guitar is crucial to the longevity of the instrument as well as for maintaining the Warranty. I build in a constant environment of 44-46% Relative Humidity at approx. 72 degrees F. which are the conditions you should strive for as well (particularly for the first year or so). Please call or write if you have further questions. What are the differences in various soundboard woods? There is no "magic" soundboard material that will guarantee a certain result. One piece of advice I try to offer people - whether they buy a guitar from me or not - is to be as descriptive as possible about your playing style and needs and let the builder suggest the appropriate wood choice. I prefer to work with either Adirondack or one of the varieties of European Spruce. But I am comfortable with Sitka Spruce (highly underrated in the world of "custom" guitars) and Western Red Cedar as well. I have never found Engleman Spruce to offer anything unique from a tonal perspective. Below is a short description of each wood. Arguably the most often used soundboard material, especially by large manufacturers such as Martin, Gibson, etc. Sitka Spruce is typically golden in color, and is relatively light, strong and stiff. Found usually in the northeast mountain ranges, Adirondack Spruce was used almost exclusively by the C.F. Martin Co. until the mid-40s. Adirondack Spruce trees are typically much smaller than the other Spruces available today so supplies (in the quality I require) are sporadic and expensive. Cosmetically these tops ordinarily contain wider grain counts and a greater color differential across the grain. Overall coloring tends to be a shade or two lighter than Sitka. Fantastic power, volume, and clarity. I use Adirondack Spruce exclusively for the bracing on all models. A very good choice for those playing styles with a "lighter touch". Has an immediately open sound and changes the least with time and age. 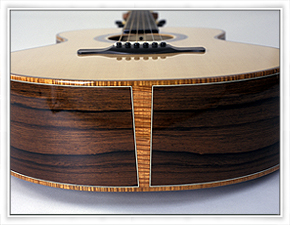 Do you offer custom inlay work or Pickup Installations? Yes. Most inlay work is done by renowned inlay artists Larry Robinson, Dave Nichols, or Tom Ellis (who is also responsible for my beautiful logos). Please call for information regarding some of the "stock" inlays we have done in the past. Since new acoustic pickup systems are constantly being introduced it would be impossible for me to keep up with the latest offerings or stock them all. So I will no longer be offering installed systems unless the pickup is provided by the customer. I will be happy to drill and ream the tailblock for the required jack upon request.